This volume critically discusses the relationship between democracy and constitutionalism. It does so with a view to respond to objections raised by legal and political philosophers who are sceptical of judicial review based on the assumption that judicial review is an undemocratic institution. The book builds on earlier literature on the moral justification of the authority of constitutional courts, and on the current attempts to develop a system on ?weak judicial review?. 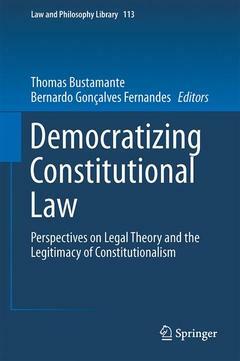 Although different in their approach, the chapters all focus on devising institutions, procedures and, in a more abstract way, normative conceptions to democratize constitutional law. These democratizing strategies may vary from a radical objection to the institution of judicial review, to a more modest proposal to justify the authority of constitutional courts in their ?deliberative performance? or to create constitutional juries that may be more aware of a community?s constitutional morality than constitutional courts are. The book connects abstract theoretical discussions about the moral justification of constitutionalism with concrete problems, such as the relation between constitutional adjudication and deliberative democracy, the legitimacy of judicial review in international institutions, the need to create new institutions to democratize constitutionalism, the connections between philosophical conceptions and constitutional practices, the judicial review of constitutional amendments, and the criticism on strong judicial review. I Challenging and Defending Judicial Review.- 1. Randomized Judicial Review; Andrei Marmor.- 2. On the Difficulty to Ground the Authority of Constitutional Courts: Can Strong Judicial Review be Morally Justified? ; Thomas Bustamante.- 3. The Reasons without Vote: The Representative and Majoritarian Function of Constitutional Courts; Luís Roberto Barroso.- II Constitutional Dialogues and Constitutional Deliberation.- 4. Decoupling Judicial Review From Judicial Supremacy; Stephen Gardbaum.- 5. Scope and limits of dialogic constitutionalism; Roberto Gargarella.- 6. A Defence of a Broader Sense of Constitutional Dialogues based on Jeremy Waldron's Criticism on Judicial Review; Bernardo Gonçalves Fernandes.- III Institutional Alternatives for Constitutional Changes.- 7. New Institutional Mechanisms for Making Constitutional Law; Mark Tushnet.- 8. Democratic Constitutional Change: Assessing Institutional Possibilities; Christopher Zurn.- 9. The Unconstitutionality of Constitutional Changes in Colombia: a Tension between Majoritatian and Constitutional Democracy; Gonzalo Ramírez Cleves.- IV Constitutional Promises and Democratic Participation.- 10. Is there such thing as a radical constitution? ; Vera Karam de Chueiri.- 11. Judicial reference to community values - A pointer towards constitutional juries? ; Eric Ghosh.- V Legal Theory and Constitutional Interpretation.- 12. Common Law Constitutionalism and the Written Constitution; Wil Waluchow and Katharina Stevens.- 13. On how law is not like chess – Dworkin and the theory of conceptual types; Ronaldo Porto Macedo Júnior.